Austin17 - Scottsdale, Arizona Great vision and super comfortable "I got 2 pairs of Viral Brand goggles And a few sets of tear offs and extra lenses. 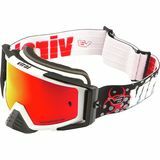 Best Goggles on the market by far. Super comfortable they fit great and get the best vision out of them. I highley recommend getting yourself a pair." Sprinklerdude - New Mexico Comfortable "Most comfortable Google I've worn to date!"